George Edward ("Eddie") Pope (December 24, 1973) is a retired American soccer player who last played for Real Salt Lake of Major League Soccer and spent eleven years as a defender for the United States national team. He is a member of the National Soccer Hall of Fame. Born in Greensboro, he attended Southwest Guilford High School. Pope had a very successful career playing for the North Carolina Tar Heels where he also kicked for Mack Brown's football team. In 1994, he was a first team All-American, and also earned All-ACC and All-South Region honors. In 1996, D.C. United selected Pope in the first round (second overall) in the MLS College Draft. His first season in Washington, D.C. was split between United and the men's Olympic team, which was preparing for the 1996 Summer Olympics in Atlanta, Georgia. However, he still played 18 games for United and won a league title with the team, scoring a golden goal in the MLS Cup against the Los Angeles Galaxy. He also played his first game with the national team, helping the team beat Trinidad and Tobago 2-0 on November 10. In 1997, Pope made quite a splash on the MLS scene. He was named MLS Defender of the Year and earned a place in the MLS Best XI, as well as winning a second MLS title. In 1998, Pope helped United win both the CONCACAF Champions Cup and the InterAmerican Cup, the first continental honors earned by an MLS team. He scored the winning goal in United's victory in the Interamerican Cup. Pope's 1999 season was beset by injuries, and his playing time was limited, which continued to pester him into 2000, although he would play 19 and 21 games, respectively, in those seasons, and he earned his third and fourth consecutive trips to the MLS All-Star Game. Pope was named the MLS Humanitarian of the Year in 2000. Injuries continued to dog Pope in 2001, but he again played in the All-Star Game and also played an important role in the national team's World Cup qualification. His injuries continued into the 2002 MLS season, and he only appeared in seventeen matches. On December 23, 2002, Pope was traded to the MetroStars, along with Jaime Moreno and Richie Williams, in return for Mike Petke, a first-round draft pick, and an allocation. Pope continued his quality play with the MetroStars, captaining the team to an excellent defensive record. He was named to the MLS Best XI for the third time for his efforts. In 2004, he had a down year with the Metros, but was still voted to the MLS Best XI for a second consecutive season. After the year, Pope was traded to expansion Salt Lake for an allocation. He played three seasons with Real Salt Lake, providing veteran leadership for the expansion franchise. In 2007, he retired from professional soccer. In ten years in MLS, he scored nine goals and ten assists, plus added that MLS Cup goal and an assist in the playoffs. In 2005, he was named to the MLS All-Time Best XI. In 1996, Pope began his international career with the United States men's national soccer team. At the time, he was in his rookie season with D.C. United. He quickly became a fixture for the national team, which surprised the world when it defeated Brazil 1-0 and made its way to the finals of the CONCACAF Gold Cup. Pope also played in two games for the US's disappointing campaign at the 1998 FIFA World Cup. In 2002, he started all five U.S. matches in the World Cup, and played a big part in the surprising success of the United States in that tournament. 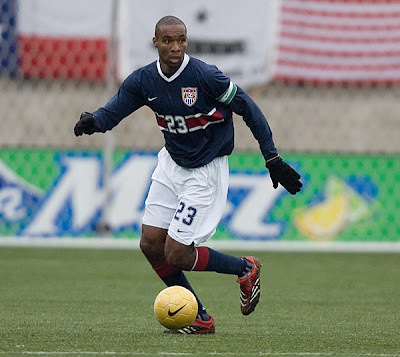 In 2006, Pope was part of the US team that participated to the 2006 FIFA World Cup. In the second match against Italy, he received a red card which caused him to miss the third match against Ghana, the last of his team at the tournament. Pope started every game he played with the national team. On August 3, 2006, Pope announced his retirement from international soccer. His international career included 82 caps and 8 goals over an eleven-year period. On June 14, 2007, Pope announced his plans to retire from all competitive soccer at the end of the 2007 season, saying: "It's just time...You get up in the morning and you're in pain. Before practice, you are in pain. And after practice you are still in pain." On March 11, 2011, Pope was selected for induction into the National Soccer Hall of Fame.